Kristi Hager lives in Missoula, Montana, and has worked as a self-employed photographer and multi-disciplinary artist since 1984. She was a presenter at the Art, Culture, Nature Conference in Flagstaff, Arizona, in 2001. In 2003, Hager received a Gottlieb Foundation Individual Support grant based on her twenty years of artistic achievement. StoryCorps featured her audio tribute to her mother on National Public Radio in February 2006. Her book, Evelyn Cameron: Montana’s Frontier Photographer, was selected by the Montana Book Awards as an honor winner in 2007. 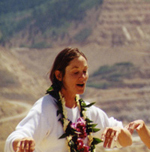 In the early 1980s, Hager lived in the Bay Area and took hula lessons on a whim. The dance changed her art and her life. In 2000, she produced, directed, and choreographed a live performance titled “Cool Water Hula: An Art Action,” and produced a video documenting this event. The story of the Cool Water Hula is now a part of a new history book for all middle school students in Montana. The Cool Water Hula’s tenth anniversary is being performed live on July 10, 2010, in Butte, Montana.